There are always a few obstinate green tomatoes left on the vine, in the fall. Deciding whether to pick the tomatoes green or risk letting them get hit by frost, is a tough call. Not all green tomatoes will ripen off the vine, but there are some steps you can take, to ensure they will. Most tomatoes need temperatures above 60 degrees F. to finish ripening and some fall days can be warmer than others. But once the days begin to shorten and remain cool, you are going to need to take some precautions to prevent losing your final tomato harvest. 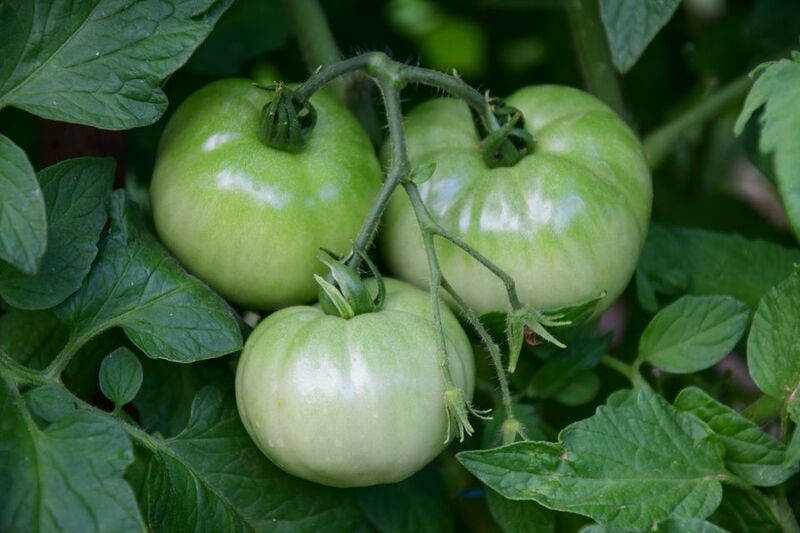 Here are some tips to keep your tomato plants healthy into the fall season and for getting those green tomatoes to ripen on the vine or how to salvage those stubborn tomatoes you have to pick while still green. It’s not worth spraying for diseases at this point in the season. Just remove any diseased leaves and dispose of them. Give your tomato plants a last dose of food. Some compost tea or fish emulsion should give them the energy to finish up the season. Once nighttime temperatures start dipping into the low 70s F., you probably aren’t going to get any new fruits forming. To speed up the ripening of the existing green tomatoes, pinch off any new flowers. If a light frost is predicted, cover your plants with a row cover or sheet. You can leave the row cover on during the day, but the sheet is too heavy and opaque, so remove and replace as needed. If you've done everything you could to keep them going and they get hit by an unexpected frost, don’t panic. Your tomato plants aren’t meant to last forever, so be thankful for the crop you've gotten and start planning for next year. Bring the Whole Plant Indoors: If you still have green tomatoes well into the cool days of fall, you can lift the entire plant and hang it in a dry, sheltered location, like the garage. The fruits will continue to ripen and will still have some of the benefits of ripening on the vine. Try and take some roots with the plant, but you can shake off any soil. You do not want to hang the plants in direct sunlight or total darkness. Placing your tomatoes on a sunny windowsill. This is a hit or miss solution. You’ll have much better luck ripening tomatoes that already have a fair amount of color. Although the tomatoes are more stable sitting on their stem side, they will rot less readily if you can place them blossom side down. Wrapping individual green tomatoes in newspaper and layering them in a box, no more than 2 layers deep. Place the box in a dark, dry spot and check weekly for progress. It usually takes 3-4 weeks for the tomatoes to ripen, but check frequently and remove any fruits that show signs of rotting. Placing the green tomatoes in a paper bag with a ripe apple will speed up the process. The apple gives off ethylene gas, which speeds up ripening. Check the bag daily. Tomato Diseases:Is It Early Blight, Late Blight or Septoria? Does it Matter if Tomatoes are Determinate or Inderminate?